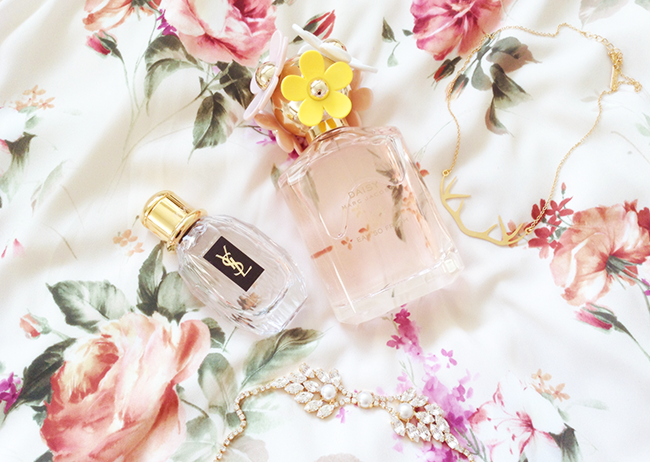 Perfumes are something that I love loads. I love beautiful scents, beautiful bottles. I have done perfumes collection post previously (read here), but it was so long ago so I decided it was a time for an update. As you have already noticed, most of them are Marc Jacobs, but what can I say, I love his fragrances! My favorites from all of above are Marc Jacobs eau so fresh and YSL Parisienne. I'm just crazy about these two, they are both very fresh, floral, fruity, and I would say citrusy and crispy. They are more of a day time perfumes, but I would wear them anyday anytime! On the other hand Marc Jacobs Lola and Guerlain la petite robe noire I would definitely consider as a night time scents. Marc Jacobs Daisy Sunshine and Honey are very sweet, sultry, the perfect summer fragrances whilst Daisy eau so fresh sunshine and the original Daisy I'd say are very fresh scents, something I'd wear right after the shower. They are all different and I love them all! What's your favorite perfume? I never used that parfumes, but I always had a look on for its package!! Lola Marc Jacobs- I love them! 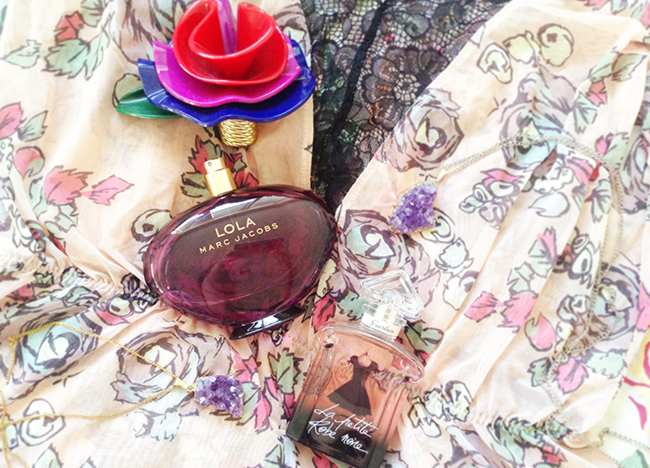 I love perfumes so much; it's just so beautiful in a room ! I just love perfume, it gives that little extra! I'm following, I hope you'll do the same! I'm a perfume lover too!! Very nice collection! Do you want to follow each other on GFC and Fb?Let me know on my blog! 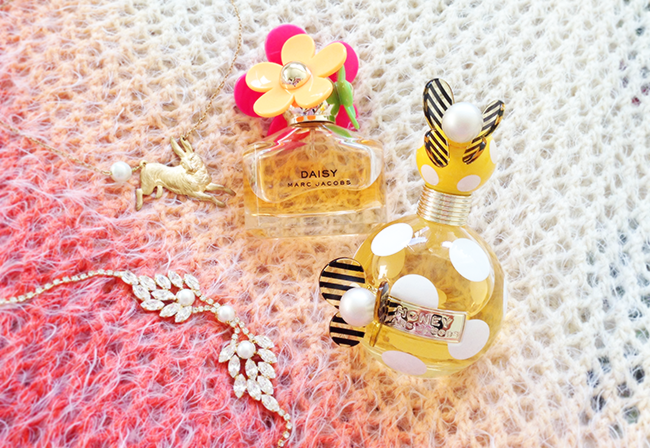 Love this collection, I recently got the Daisy perfume and I'm obsessed! Those Flacons all look very beautiful... nice collection! I have a few favourites, but my Top 3 timeless Perfumes are CK ONE, Kenzo Flower & Betty Barclay's Pure Style. The Daisy bottles are too cute! Im in love with Marc Jacobs perfumes! Thank you for the follow, about to follow you too. Your blog is so pretty and such amazing photography! Your blog is very inspiring. Love the photos! Thanks for your nice comment and for following. Follow you on everywhere. Great selection of perfumes, my favourite one is YSL, totally amazing! Agora vou trazer o meu Lola. I understand why you love perfume and perfume bottles so much. Having a signatura fragrance is very nice and those bottles are just beautiful! So much perfume. I love the Marc Jacobs ones! Marc Jacob's Honey perfume is lovely! It's definitely a scent I enjoy. Marc Jacob's "Honey" has been THE scent I go to lately. I just love it so much. OMG! I love your perfume collection! They're all so pretty and girly! 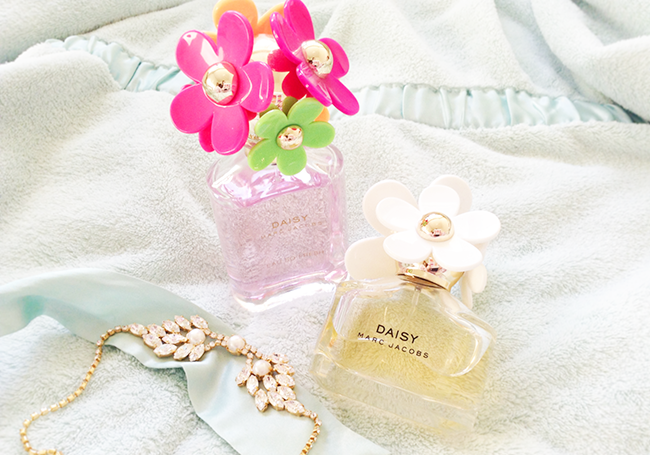 Marc Jacobs' Daisy is also one of my favourite! Oh wow such a gorgeous collection ! I've also recently got into perfumes ! I love "Le petite robe noir"
Thanks for visiting my page and following :) I just followed back! It's like I'm in heaven:) all my fav! I may give it a go with "daisy" as it seems to be a popular perfume across the bloggers ;) beautiful pictures! I really love your blogstyle and pics! so I'm your new follower on GFC, so please follow me back. 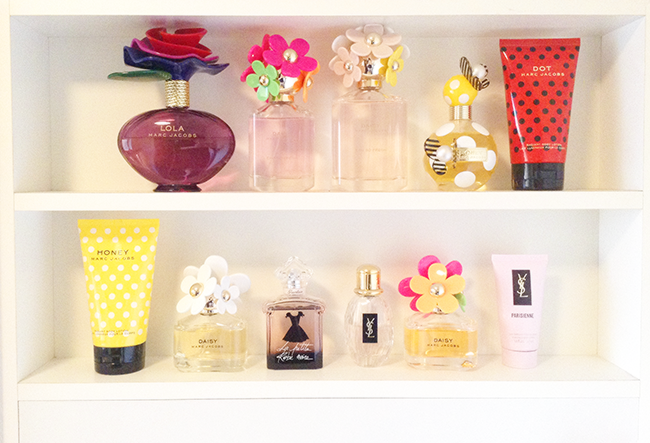 This collection is so similar to mine but my signature scent is Chanel NO.5 Lola is a close second though! Gorgeous pictures! Love how you choose the different accessories. I love Honey by Marc Jacobs a lot. You have a nice perfume collection. Amazing collection, I Like it. All the photos looks amazing. And your perfume collection is everything I wish for! wonderful!Thanks for sharing.I really like it.